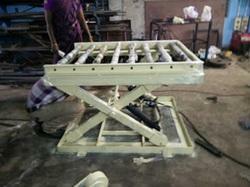 Prominent & Leading Manufacturer from Chennai, we offer scissor lift. We offer vast range of High Lifting Scissor Lift. This range has maximum lift height of 40 feet (12 Mtrs) and a load capacity that ranges from 2000 Kgs. to 6000 Kgs. The array can be availed in various dimensions as per the individual requirements of the clients. Moreover, the range also boasts of a strong & sturdy construction with precisely machined moving components. We are looking buyer of High Lifting Scissor Lift from all over india.